KOKOMO, Ind. – Not often does a small town sports publication garner national attention. But that is what has happened to our very own publication. Less than 16 months after its debut, the Sports Journal of Central Indiana staff learned it will be awarded one of the most prestigious awards in journalism – the 2011 Sigma Delta Chi Award for excellence in journalism from the Society of Professional Journalists. The Sports Journal won in the category of sports photography (newspaper circulation 1-100,000, regional magazine, non-daily publication or online independent). The first awards were presented in 1932. Wildkats to the state championship game. Gibson is being recognized for taking the actual picture and Hockney for the subsequent workup and layout of the front page photo. “For as small a publication as we are, I am thrilled that we are being recognized,” Hockney said. “We are a low budget publication with a small staff, but we know our photography is something that is a draw since every picture we publish is of high quality and in color. 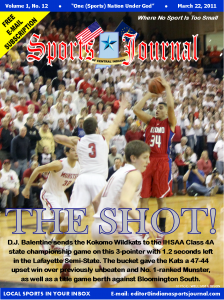 When I started the Sports Journal, I wanted our photography to be top notch and a focal point each week. Greg Rakestraw, an on-air sports personality for Hometown Sports and News and ESPN 1070 the Fan in Indianapolis, said the Sports Journal is at the forefront of the new age of journalism. Sigma Delta Chi Awards are one of the most prestigious in journalism and is awarded by the SPJ – the largest journalism organization in the United States. Other publications that were honored with 2011 Sigma Delta Chi awards include WISH-TV (Indiana State Fair tragedy coverage), The (Muncie) Star Press, ABC World News with Diane Sawyer, Chicago Tribune, 60 Minutes, Sports Illustrated, The Boston Globe, The Los Angeles Times, New York Times and The Wall Street Journal. For a complete list of winners, visit the Sports Journal website. D.C., to accept the award. Investigative Journalism. Published in Good Housekeeping. 60 Minutes: Hard times generation (I) – by Scott Pelley, Robert G.